One of the cornerstones of survival, finding enough food to keep you and your loved ones alive when times get tough, is arguably the most important challenge you will face. In survival situations, though, some foods will make the cut while others are best reserved for softer times (sorry chocolate cake lovers). When it comes to disaster preparedness, there is a reason certain foods have remained so popular in survivalist circles. 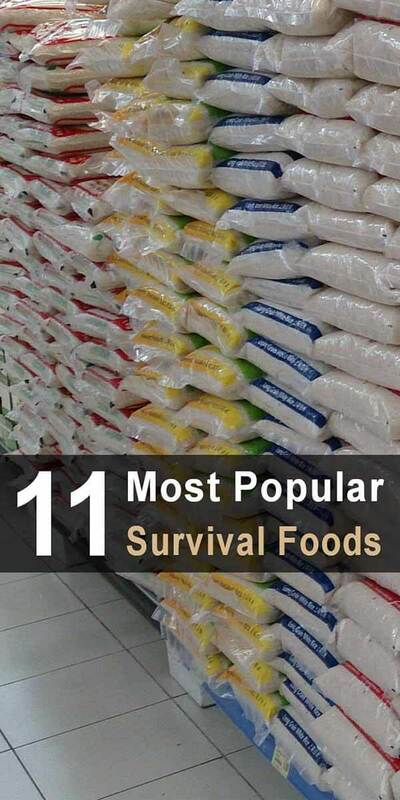 If you are looking to stock up on foods that will get you through when the SHTF, check out these 11 survival foods. Note: Normally when listing products, I would link to them on Amazon.com, but almost all of these foods are much cheaper at stores like Costco or Sam’s Club. I highly recommend you purchase these foods at one of those stores instead of online. The prices I mention are based on the prices I’ve seen at my local Sam’s Club (in Florida; other stores around the country may be more expensive). Peanut butter is high in protein, super filling, has a fairly long shelf life, and is relatively affordable, allowing preppers to stock up on bulk amounts of peanut butter without having to take out a second mortgage. Peanut butter has an unopened shelf life of one year and only costs about $2.50 a pound. For a large portion of the world, rice is a daily staple, supplying the majority of a person’s nutritional needs. It’s one of the cheapest foods you can buy, it’s easy to store, and it lasts for decades if you store it properly. White rice can be purchased for around $15 per 50 lb. bag. If college students can survive on Ramen noodles for four years, so can you. They’re not particularly nutritious (as in not at all), but they are incredibly cheap and tasty enough to add a little variety to the foods you’ll be eating in a disaster scenario. Combine that with the fact that Ramen Noodles have an indefinite shelf life and you’ve got a survival food just good enough to make the list. As far as the cost of this incredibly cheap meal goes, Ramen Noodles can be purchased for about 17 cents a package, meaning that, if Ramen Noodles is all you ate, you could eat three meals a day for an entire year and only spend $186.15 (although you shouldn’t actually do that as they’re very high in sodium). Another simple, filling crop, beans are a lot like rice in their affordability and shelf life. They’re easy to store, high in nutrients, have an indefinite shelf life, and are by far one of the most popular survival foods. As an added bonus, the same beans that can be eaten can also be planted to grow more beans if needed. The price of beans depends on the variety, but pinto beans, for example, cost about $30 for a 50 lb. bag. Surviving in a post-apocalyptic world takes a lot of energy, which means you’ll want to know how to make coffee when the power is out. Fortunately, coffee has a great storage life and, although not incredibly cheap, is affordable enough to set back an ample enough supply for tough times. For a 48 oz. can of coffee grounds, you can expect to pay around $12. The chicken of the sea is a great survival food and one of the few meat products that will make the list of popular foods for disaster situations. For meats, spoilage is a real problem, but tuna has a great shelf life and will last up to five years unopened, making it a viable source of tasty protein in a disaster situation. Tuna is also full of nutrients and is affordable enough to buy in bulk. On average, a can of tuna costs less than a dollar when bought in bulk. If you think the post-apocalypse is going to be completely void of your favorite foods, rejoice in the fact that pasta is one of the most popular survival foods. Though what you will season it with is a different story, pasta is another affordable, easy to store, and long-lasting food that is right at home in a survival setting. The cost of pasta varies depending on the type of pasta you’re buying, but you can get spaghetti for less than a dollar a pound. Oil is essential for cooking a large number of foods. Unfortunately, most oils don’t have a long enough shelf life to be viable for long-term storage. Coconut oil, though, is the exception, able to last a reasonable two years before it begins to spoil. If you’re planning on frying anything post-disaster, coconut oil is your best choice. As an added bonus, it’s one of the healthiest oils you can cook with. You can get an 8-pound pail of coconut oil for about $30. During the days of the Roman empire, salt was one of the most valuable things a person could own. While it may not have the same value this day and age, salt is still an irreplaceable food item to have in a disaster situation. It can be used to make almost any food more palatable, can be used to cure beef, and can also be used for a wide range of other purposes such as easing a sinus infection and cleaning a kitchen counter. Common table salt has an indefinite shelf life and costs less than $2 a pound. Instead of storing flour for your post-disaster baking needs, consider storing cornmeal. Cornmeal can be used in many of the same applications as flour, plus it has a much longer shelf life. While flour requires yeast and oil to make biscuits or bread, cornbread and tortillas made from flour can be baked without these things and come out nicely when cooked in a solar oven or a simple skillet. Stored in a dry area, cornmeal can last up to two years and will cost around $15 for a 25 lb. bag. Honey isn’t all that cheap, which makes buying it in bulk a tough pill to swallow for cost-cutting preppers. However, honey can be used to add a nice boost of calories and flavor to a meal, it’s one of the few sweets with an indefinite shelf life, and it’s good for you. As long as you use it sparingly, a little honey will go a long way. On average, you can expect to pay around $14 for a 40 oz. bottle of raw honey. If you haven’t already started purchasing these foods in bulk, it’s time to get started. Join Costco or Sam’s Club and you’ll find you can put away a lot of food for less money than you might think. « Are Millennials Ready for SHTF? Ramen must have an oily costing. because it goes rancid before a year. A note on coconut oil is that it’s not as healthy as previously thought. It’s very high in saturated fats, about 90%. Brown rice and beans together form a complete protein, a substitute for meat. And a lot cheaper, too. I eat from what I have in storage, and replace and rotate 4 times a year. Thanks for the tips! But I have a question, at what temperature can these products be left at as I live in Canada where minus 25 degrees is a common thing. The ONLY thing on the list which I would have an issue with storing at – 25F or colder is the tuna … the article sadly did not specify what the tuna was packed in [water or oil] if oil it can stand colder than packed in water. Also if given a choice I would pick the oil packed over water as for the same weight in my pack you get more food value… btw everything else on that list could be put into a freezer safely. Honey offers the additional virtue of being a good anti-bacterial agent. It’s been used for millennia to heal infected wounds. It’s not perfect, but it’s better than nothing, especially in hard times. Coffee isn’t a survival food as it has very little nutrional value(a couple micro nutrients),better choice is cocoa powder,good amount of calories,real moral booster(actually effects pleasure center of brain) and should have long shelf life. Peanut butter is good stored for much longer than a year, coconut oil and corn meal lasts a lot linger also, if unopened and stored properly. Invest in a good manual grain grinder. Wheat and corn, as grains, lasts infinitely longer than the ground product. Grind flour and cornmeal as needed. You can buy both, in resealable buckets. You can get things like Rye, different kinds of wheat, corn, sorghum, barley, rice – which can also be ground into rice flour – and several other kinds of grains.